I have read many reviews of the new 718 cars, and as car journalists tend to play “follow my leader” they have all been depressingly alike. 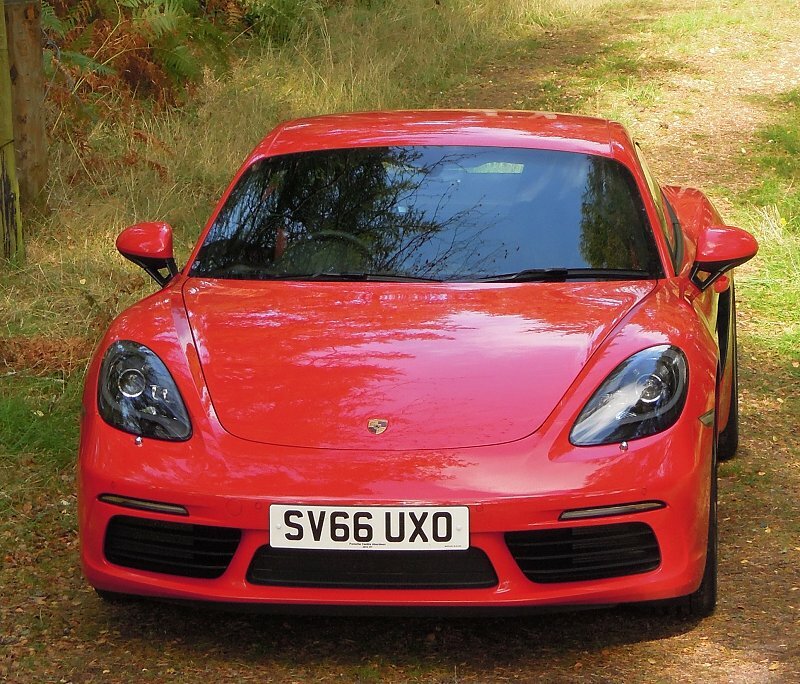 The gist is invariably this … pretty cars, very fast, great handling, but they make a horrid noise like a Subaru and Porsche has lost the plot by ditching the flat six. The final verdict is invariably a sort of grudging faint praise. I beg to differ. 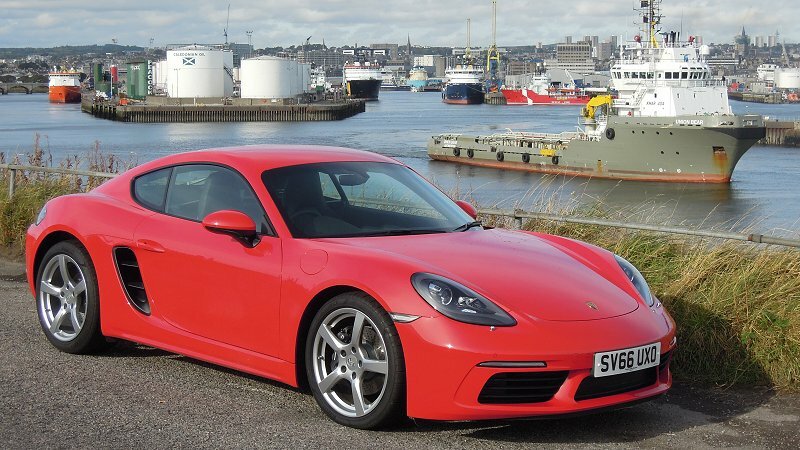 I have just driven the new base model Cayman, and I think it is the best sports car in the Porsche range, certainly the most relevant one for real world road use. In the ten years since I bought my original 2.7 Cayman I have driven pretty much everything Porsche has made, but this base 718 Cayman is genuinely the first car in a decade that makes me want to put my hand in my pocket. From a Scotsman, this is the ultimate praise! I know I have now just committed the cardinal sin of motoring journalism by revealing my verdict first, but bear with me as this car is worthy of some more thoughtful analysis than the motoring press has dished out thus far. Let’s start with the principal bête noir, the dreaded exhaust note. I start the car and am momentarily taken aback as the revs flare and there is a distinct guttural bark from the exhaust, yet it quickly settles into a deep thrummy idle. Three hours and many miles later when I hand the car back, it strikes me that I have barely given the exhaust note a second thought. At cruising speed it simply isn’t an issue, and when you summon up some grunt it emits a deep and quite cultured bark. Sure, it sounds quite unlike a flat six, but to my ears at least it is not objectionable, simply different and is part of the unique character of the car. Please note that this was a lightly specced car without the sports exhaust, and all the better for it in my opinion. I am becoming rather irritated by some of these rather juvenile, shouty exhaust systems, and I suspect the 718 would sound quite different with one, so my advice would be to listen to one before you tick the option box. So what about the argument that Porsche have somehow downgraded the car by fitting a flat four? The truth of course is that the company was founded on the 356 and a flat four engine, long before the 911 came along. Even then the 912 and the 914 offered a four cylinder engine as an entry level to the sports car range. For two decades from the Seventies to the Nineties, the four cylinder transaxle cars, the 924, 944 and 968, kept the good ship Porsche afloat financially long enough for the water cooled revolution to save their bacon. I would not be surprised if up to this point the company had actually made more four cylinder engines than sixes. Then comes the Nineties, Wendelin Wiedikin and the watercooled cars, where two distinct ranges (Carrera and Boxster) were spun out of one chassis by platform sharing. This cost saving also extended to the engines, all were flat sixes of the same architecture, merely differing in capacity. A cost saving master stroke, but one which I would speculate has irritated the product planners ever since, as it blurred the lines between the two ranges, making it harder to justify the Carrera as the premium car. But a lot has changed in those twenty years, engine management systems have improved, turbos are now common and engine size is no longer correlated directly to power, so the new 718 small turbo engines are by no means the poor relation. Twenty years on, the product planners have finally won out and with the coming of the 718 the mighty 911 is left alone to bask in its flat six glory and the product hierarchy has been finally re-established as was probably intended decades ago. So I am coming at this from a different angle, not seeing the new four as a downgrade, just a logical re-assessment of the sports car range, and Porsche now has a four cylinder entry level range like they have done from the beginning. Makes perfect sense to me! All the good stuff you’ve read about the 718 Cayman is true. This is one handsome car, in particular the treatment of the nose is superb, chiselled and sharp, and the detailing follows through the rest of the car too. I’m not too keen on the black badge strip below the rear spoiler, but I guess it’s not a deal breaker. Mercifully it has not put on weight and become bloated like so many cars do, and it remains a handy size on the road. To my eye it is the most handsome iteration of the Cayman since the original rather more rounded design, although parked side by side with mine, I am reminded what a timeless piece of design the first series is. How long till it acquires modern classic status I wonder? The interior is a variant of generic Porsche, but none the worse for that. It is clear, logical, superbly built and very comfortable, what more could you ask for. There is a complex array of infotainment options to tempt you and drain your wallet, but this is of no huge interest to me right now, as this is an entry level sports car and I like it simple. Mercifully my test car has been fairly lightly specced with a manual gearbox , only the 19” wheel upgrade instead of the 20” and it is all the better for it. It means I can assess the car, not the toys. Perhaps the first thing I notice is how spectacularly good the ride is. I am presuming the car is on standard suspension, and it is undeniably firm with little body roll, but there is none of that brittle low speed jarring that you associate with firm suspension. It adds greatly to the comfort level, which even in a sports car is important. Next I notice how pin sharp the steering is, very precise and quick, but with no twitchiness at all, quite sublime. Of course it’s electrically assisted, which as I recall was treated as the work of the devil when it first came out, yet I rarely see it mentioned now. What short memories our motoring commentators have! As ever the control weightings of the pedals are perfect, and the gearchange action must be the best I’ve ever encountered. This may be a scalpel of a car, a delicious precision driving tool, but it is also comfortable, practical with good visibility and easy to drive in town. 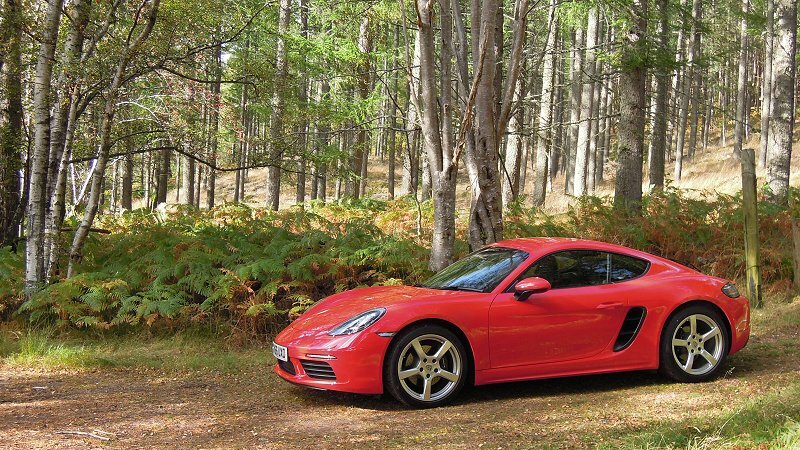 These attributes do not always go together, and all of this helps to give the Cayman a very attractive dual personality. The last of the six cylinder Caymans also have a dual personality, but one I can find annoying. The combination of very revvy engines with the powerband at the top end of the rev range, combined with exceptionally long gearing means that to really get the car on the plane you are by definition having to do highly illegal speeds. Either that or you have to drive everywhere in third gear, which of course is a nonsense. Drop down to sensible speeds and the engines, although flexible, are so far off the cam that they feel asleep. I recall a 981 2.7 Cayman PDK I was lent while mine was in for work which was an utter somnambulist at the legal limit on an A class road. I hated it, and this from a Cayman fan too. Not so the 718. It too has a revvy engine and the obligatory long gearing, but it has an ace up its sleeve … torque, and lots of it! Within reason, you can pretty much press the throttle in any gear at any speed and the car responds. Turbo lag is remarkably absent unless you really go looking for it, and all this combines to give the car a bright eager feeling which is only ever a toe prod away, yet otherwise it cruises efficiently and quietly. This is the real key difference of the 718, the key to its dual personality, and it is a sensation I have not really associated with Porsche’s sports cars before. If you like your Porsches to be all sturm und drang you may not like this, indeed you may hate it, but in todays crowded and speed controlled roads it brings a little bit of sparkle to the daily grind. Indeed it reminds me a lot of the AMG GT I drove last year, the full fat four litre V8 twin turbo, 500 bhp job. It was probably the first car I ever drove which could morph from suave city gent to snarling hooligan with the flick of your right foot, and I loved it. Not just because it was scaldingly fast, but because it was civilised at lower speeds as well, and didn’t seem to be always goading me to drive like a loonie. It may seem an odd parallel to draw but the 718 Cayman feels like its little brother, and I mean that as high praise. So the 718 makes a comfortable and lively cruiser, but please don’t think that that is the whole story, because this is also a very fast car, as the brochure figures of 5.1 sec to 60 and 170 mph would suggest. In fact I’d venture to suggest that 0-60 figure may be conservative. At one point I overtook a car towing a caravan, there was ample space for the manoeuvre so I didn’t bother to change down and gun it, I just pressed the loud pedal. I was genuinely gobsmacked by the speed with which the car gathered pace, and all the more so as it was done with a degree of civility, rather than much revving and shouting. I was past and back on my side of the road way sooner than I had expected, very impressive for a two litre engine, and it rather caused me to re-calibrate my expectations of this car. This mixture of smoothness and speed, and the seamless ability to transform from one to the other is very beguiling, in my experience something quite new to the Porsche sports car repertoire, and I like it. I did not get much opportunity to press on, but the combination of brilliant brakes, steering and handling mixed with this fantastic new engine means that as and when you do get the chance you will realise that this is what a modern sports car is meant to be. More to the point, in my opinion at least, this is what a Porsche is meant to be. Porsche built their reputation by beating the opposition using intelligent engineering, lightness and precision, rather than huge power. Sadly they have followed fashion by building ever larger, more powerful and more luxurious cars, because that is what the market demands, it’s where the profit margins are, and they have shareholders to appease. I would argue that this entry level Cayman, especially in a simple specification, has more of the original spirit of the brand, more proper Porsche DNA, than anything else they presently build. Exhaust note? … what exhaust note!